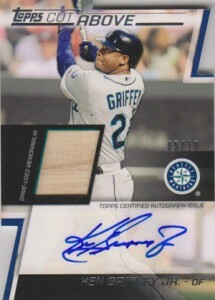 Home » Baseball » What Are the Top Selling 2012 Topps Series 2 Baseball Cards? What Are the Top Selling 2012 Topps Series 2 Baseball Cards? With empty wrappers starting to it the floor (and the mailbox), collectors are uncovering the gems of 2012 Topps Series 2 Baseball. So far, high-end sales have been dominated by a pair of rookies who have been dominating the last several sets: Yu Darvish and Bryce Harper. In fact, they account for seven of the top ten eBay sales since the set was released last Wednesday. 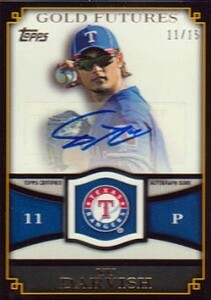 Leading all online sales was a 2012 Topps Series 2 Gold Futures Yu Darvish Autograph. Serial numbered to 15 copies and featuring a sticker signature, one went for an astounding $1,200. Another one sold for less than half that, closing at $590, which is probably more in line with what one might expect. The number of Darvish autographs on the market have exploded since the release of 2012 Bowman Baseball and 2012 Topps Archives. 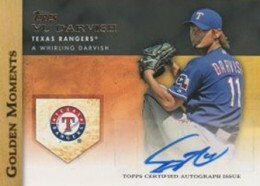 A Golden Moments Darvish autograph sold for $375. 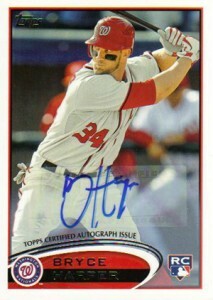 The 2012 Topps Series 2 Baseball Bryce Harper Autograph Variation pretty much ruled the bottom half of the list. After one reached an eBay high of $470, they're settling in the $350-400 range. 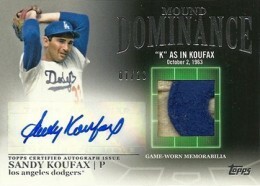 The top card that doesn't feature Darvish or Harper is a Sandy Koufax Mound Dominance Autographed Patch, which brought in $835.99. Koufax cards always sell strong, but there aren't a lot of multi-color patch cards. This likely accounted for the huge interest. 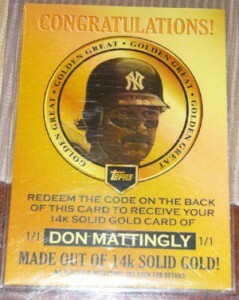 A 14k Gold Don Mattingly redemption sold for $700. The 1/1 continues the insert set started in 2012 Topps Series 1 Baseball. The redeemed card will be made of gold. Ken Griffey Jr. autographs now look to be live in packs. For the first handful of 2012 Topps products, the recently retired superstar has been the subject of several redemption cards. However, a 2012 Topps Series 2 Baseball Cut Above Autographed Relic of the future Hall of Famer is live. A copy of the die-cut card, which is numbered to 10, sold for $480.22.